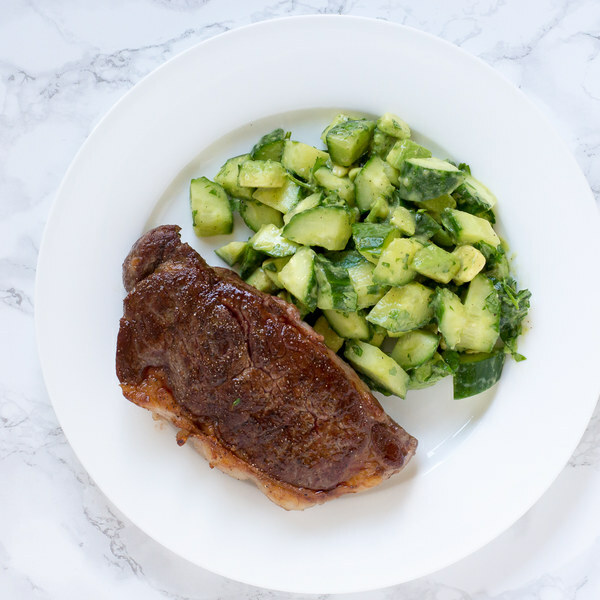 ← Chili-Rubbed Striploin Steak with Avocado-Cucumber Salad. In a small bowl, combine chili powder, salt, and pepper. While the skillet heats up, pat the steak dry with paper towels and place on a plate; rub with the spice mixture on both sides. Halve the cucumber crosswise, then quarter lengthwise and slice crosswise at an angle; transfer to a salad bowl. Halve and pit the avocado; scoop out the flesh with a spoon and medium dice; add to the salad bowl. Using a knife, shave the cilantro leaves off the stems at a downward angle, working away from your body; discard the stems and finely chop the leaves. Add to the salad bowl. Juice the lime and pour over the salad. Drizzle the salad with olive oil and season with cumin, salt, and pepper; toss to combine. To serve, divide the steak and salad between plates. Enjoy!